I came across your name in NEW YORK MAGAZINE (June 16, 1986), and it percolated a very fond memory of you. At Oberlin, Peter and I were friends, and your house and family on the upper East Side was a stopping and launching point for me in 1965, when I sold my motorcycle, packed my cello in its hard case, and went off to Europe with a one-way steamship ticket and less than three hundred dollars in my pocket. The night before I sailed, you handed me a twenty dollar bill across the table at a French restaurant, saying "You'll need this." You also paid for dinner. I appreciated your generosity very much. Twenty dollars was a month's stay at the youth hostel. Now at age forty-one, I have grown to understand that generosity and strive to practice that same thoughtful giving when chance allows, thinking of you. I hope that Peter is well and that you yourself may live for at least another century to teach others by your example. Even when asked if a magazine about New York life had "been done before," Mr. Felker omits mention of Cue magazine, founded by my father, Mort Glankoff, in 1932. Cue was for hundreds of thousands of active, affluent New Yorkers the bible of where to go and what to do in the arts and entertainment until it was acquired by Rupert Murdoch and merged with New York magazine in 1977. Many maintain that no publication since Cue has provided as complete and reliable a consumer guide to the cultural life of New York City. Cue pioneered the field and was imitated in major cities around the world during the 1940's, 50's and 60's. True, Mr. Felker brought journalistic flair and high design to the game. But the core product -- New York's cultural vibrancy -- had been celebrated in Cue for 35 years before Clay Felker appeared. I spent the evening inputting some old letters into a reflective life-passages type of website I've been building, and a letter I had written to your dad many years ago, thanking him for his generosity when I left for Europe in 1965, percolated to the top of my archived computer files. His two-second gesture made him an important person in my life then and now. I also found your Letter to the Editor about Mort and Cue (NYT, 1995), but little else. Do you have a photo or snapshot of him I could include? I hope all is well with you and your family and you are still at the violin or viola from time to time. You were good! Called yesterday, but might have misdialed as I flew down I-95. I've been following your progress since Oakland, and you seem to have documented everything quite well, and continue to do so. I copied your email to Bruce Kelly who accompanied me to the 7th Street apartment of Bruce Waite who appeared to have borrowed/stolen your BMW 250 a few years back. We went there to rough him up one night on your behalf. Can't quite remember why you chickened out. Two tough guys from Westchester standing in for the real tough guy... the one who survived menengitis. We'll scan a photo of Mort and send it to you. Your July 8, 1986 letter to him arrived a month before he died of lung cancer. Hell, he was two weeks short of his 87th birthday and had pretty much smoked 2-3 packs a day for 60 years. At 77, following my mother's death, he married a 35-year-old woman who he loved madly and it was mutual, so he enjoyed his remaining years. Now that I live in New England, I realize that Gov. Dummer Academy is a real place, Dummer a real person once. 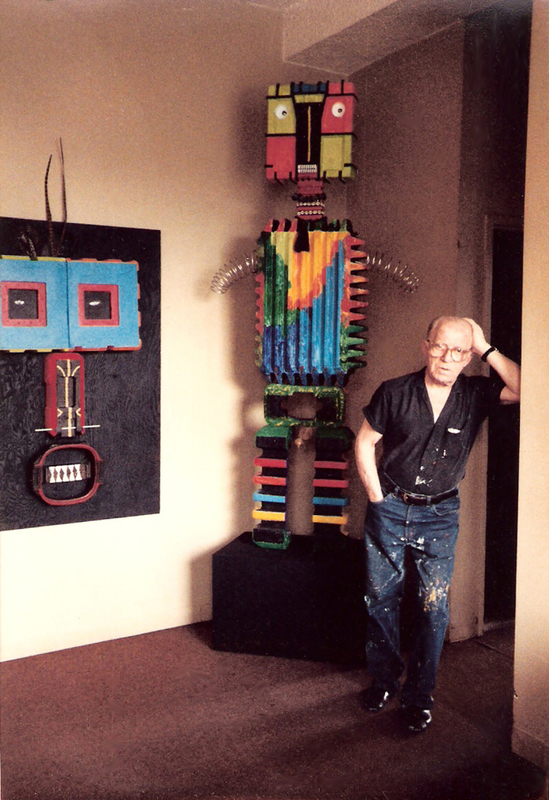 ...So late in life (he's about 80 in this picture), he goes back to playing with found objects, in this case Styrofoam packing material, and starts creating these huge totems (his word) and sculptures. He even managed to pull off a couple of exhibits at cool downtown galleries.